WASHINGTON (AP) -- Indoor tanning beds would come with new warnings about the risk of cancer and be subject to more stringent federal oversight under a proposal unveiled Monday by the Food and Drug Administration. 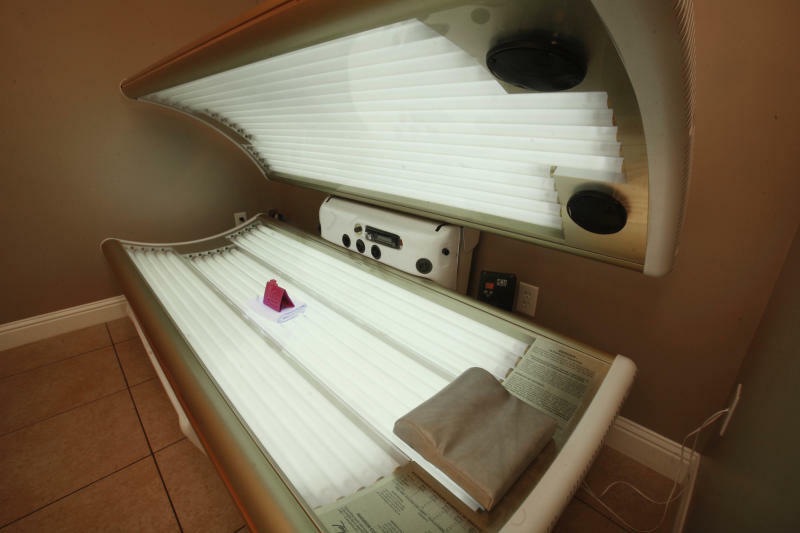 The FDA has regulated tanning beds and sun lamps for over 30 years, but for the first time ever the agency says those devices should not be used by people under age 18. The agency wants that warning on pamphlets, catalogues and websites that promote indoor tanning. And regulators are also proposing that manufacturers meet certain safety and design requirements, including timers and limits on radiation emitted. The government action is aimed at curbing cases of melanoma, the deadliest form of skin cancer, which have been on the rise for about 30 years. An estimated 2.3 million U.S. teenagers tan indoors each year, and melanoma is the second most common form of cancer among young adults, according to the American Academy of Dermatology. Recent studies have shown that the risk of melanoma is 75 percent higher in people who have been exposed to ultraviolet radiation from indoor tanning. While most cases are diagnosed in people in their 40s and 50s, the disease is linked to sun exposure at a young age. Physician groups have been urging the U.S. government to take action on tanning beds for years, citing increases in the number of cases of skin cancer among people in their teens and 20s. "As a dermatologist I see the consequences of indoor tanning. I have to diagnose too many young people with melanoma and see the grief that it causes to these families," said Dr. Mary Maloney of the American Academy of Dermatology, on a call with FDA officials. Maloney said the FDA action is an important first step, but that her group would continue to push for a ban on the sale and use of tanning beds for people under age 18. Earlier this year, a study of Missouri tanning salons found that 65 percent of 250 businesses surveyed would accept children ages 10 to 12, often without parental permission. The study was conducted by dermatologists at the Washington University School of Medicine in St. Louis. Currently the machines are classified as low-risk devices, in the same group as bandages and tongue depressors. The proposal would increase their classification to moderate-risk, or class II, devices. That would allow the FDA to review their safety and design before manufacturers begin selling them. "They don't have to provide any data in advance before they go on the market, so we have no way of providing assurance that the tanning beds are performing up to specifications," said Dr. Jeffrey Shuren, FDA's director for medical devices. Safety standards are important because recent studies show that many devices can cause sunburn even when used as directed. A 2009 study found that 58 percent of adolescents who tan indoors had sunburn exposure. "If you get an indoor tan you shouldn't be burning," Shuren said. The Indoor Tanning Association said it supported any changes that improve its customers' safety. But, in a statement, the group added that "we are concerned that these changes will burden our members with addition unnecessary governmental costs in an already difficult economic climate." The FDA proposal would not place warnings on the devices themselves, but on related promotional material and websites. Some consumer advocates said those warnings might never actually reach users. "The FDA is requiring that the labels and pamphlets include risk information about skin cancer, but consumers would not be required to see those labels or pamphlets — they are apparently only for the company buying the tanning bed," said Diana Zuckerman, of the National Research Center for Women and Families. The agency said it will take comments on its proposal for 90 days before formulating a final regulation. Agency officials didn't give a timeframe for completion, but said it would be a priority. Legendary investor Warren Buffett explains why stock buybacks make "nothing but sense"
It's Good Friday 2019. Are Banks and the Post Office Open or Closed? What About Stores and Schools?